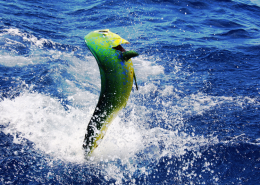 Curacao offers year round fishing but the best months are between November and June. 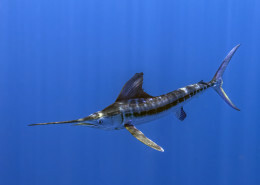 Our warm blue waters are very deep so even reasonably close to shore we find the pelagic species of fish. Further off the coast there is a number of FAD’s (fish attracting devices). 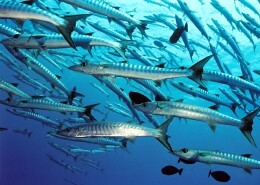 One of the prime fishing spots is Klein Curacao, a tiny island 16 miles southeast of the big island. Her you can find all the big game species I great numbers and more concentrated then around the main island. We use different methods and techniques during our trips around Curacao. We troll with both live and dead bait. 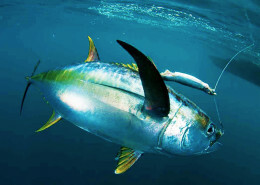 Some of our favorite baits are Skipjack Tuna, Ballyhoo and scads. The bait we use is always fresh and we catch fresh bait during our trips to. Our experienced guides have been fishing the Curacao waters for their entire life. Don’t just rely on luck, go with Fish Charter Curacao! The most distinctive local fishing method in the ABC islands in our opinion is the so called Rosario. 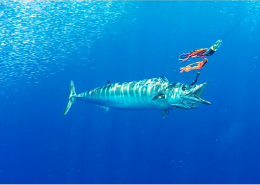 This 100 ft long and upto 15kilo/30 lbs heavy hand line is most productive fishing for wahoo. The fishing line consists of a steel cable with cigar weights casted around it every 30 cm/ 1 ft. This is followed by a 6 m/ 18 ft leader of 400 lbs. The terminal fishing tackle, a hardwire string with the hook and bait is attached to this. The heavy line brings the baits down to a depth of 8 to 10 meter or 25 to 30 ft.
We troll dead bonito, ballyhoo, scads or artificial lures at a speed of about 6 knots. The strike is registered by a large wash peg that flips of the main line. A strong rubber band stretches and takes the first few runs from the fish. Because of the weight and the speed of the boat the fish hooks its self almost instantly. After the first few hits we start pulling in the line and wahoo slowly while bringing the boat speed down to around 2 knots. You know it’s a wahoo when you feel the head shakes when pulling it in. The hardest part is in handling the leader to get the fish close enough to gaff it. This is usually where we take over. When used closer to the reef this method is also very productive for barracuda but to close to the reef and you lose the whole setup. The name Rosario comes from the Catholic Church that has the rose bead necklace with the little pebbles or beads. The fishing line resembles this as it also has small beads but they are made of lead. Religious fishermen say a prayer with every bead they put in the water to ask for a generous catch.